Rogue River, OR (October 13, 2017) – Wagner Meters’ concrete flooring division and Sitefotos, a software company, announced today a partnership which enables integration of the Sitefotos photo documentation app with Wagner’s Rapid RH® Bluetooth® Smart Reader. Wagner Meters is the first company in the flooring industry to use a Bluetooth-enabled device to allow users to take ASTM F2170 compliant relative humidity (RH) readings. This partnership allows flooring contractors and other users of the Sitefotos app to read Rapid RH® data via Bluetooth® and automatically upload the readings to the user’s account in the cloud. The moisture readings, along with any photos, are tagged to the location and project. They are then time stamped and stored on the cloud for easy and quick retrieval by the project personnel. Since 2005, the Rapid RH® system has been providing flooring professionals with extremely fast, accurate, and reliable moisture testing of concrete floor slabs before installation of finished floor products. Now, the superior, cutting-edge technology of the Rapid RH® can be paired with convenient, digital photo documentation at each jobsite. “The idea for our partnership started when the developer of Sitefotos noticed many of his customers were taking photos of the digital readings from our Rapid RH® Smart Sensors, which measure RH and temperature in concrete. After he approached us about integrating his app with the Rapid RH®, we soon saw how this could better serve not only our mutual customers, but future customers as well,” says Jason Spangler, Wagner Meters’ Flooring Division Sales Manager. 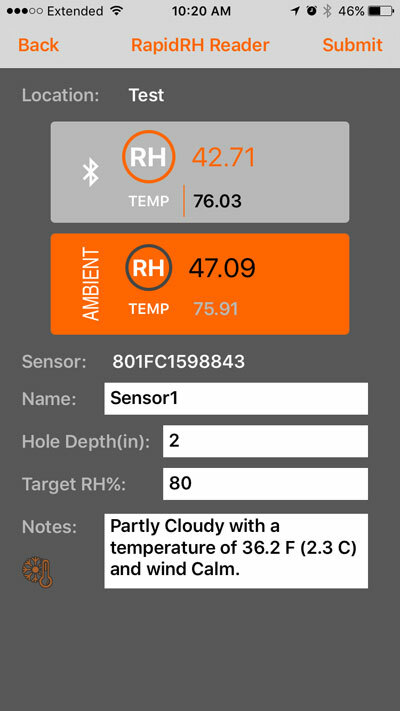 When a flooring contractor’s employees and subcontractors use the Sitefotos mobile app to take photos of flooring and project conditions, the app can now receive RH readings directly from the Rapid RH® Bluetooth® Smart Reader. This will eliminate the need to fill out paper forms and ensures that the data is categorized and time stamped to the correct project. “Having photo documentation with the date and time is not only valuable for communication involving a contractor, his employees, and subcontractors, but because everything is well documented, it’s also very valuable to help battle future liability should a flooring failure occur,” says Sitefotos CEO Michael Lindenbaum. According to Spangler, the success of this partnership could pave the way for integrating the Smart Reader with other apps in the market. “We’re certainly open to other similar opportunities should they arise,” he says. 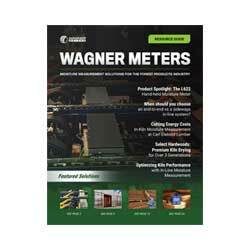 With more than 50 years experience in quality moisture measurement, Wagner Meters manufactures technologically advanced wood and concrete moisture measurement devices and moisture measurement systems for flooring professionals. Sitefotos is the leading photo documentation platform for building vendors and is designed to improve communication between building owners, managers, vendors, and subcontractors.